The amateur ball player of a poor neighborhood jumps, and in mid-air, throws the ball through the hoop. 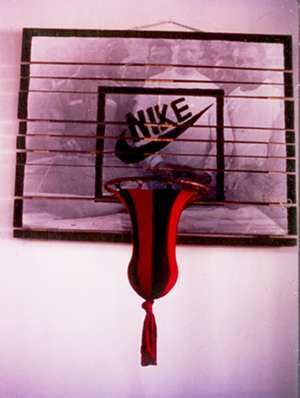 Its parabola draws in the air its own aspirations and the ball hits the backboard on which, surprisingly, appears a photograph of the autopsy of the black leader of the race war of 1912. Finally, the ball enters the basket but doesnt come out, an old knot gets in the way. This leaves the red and black tear, the drop of blood, the sexual appendage. In the end, the basket of forbidden roads.